Make the coleslaw by mixing the shredded cabbage, carrot, and onion together. 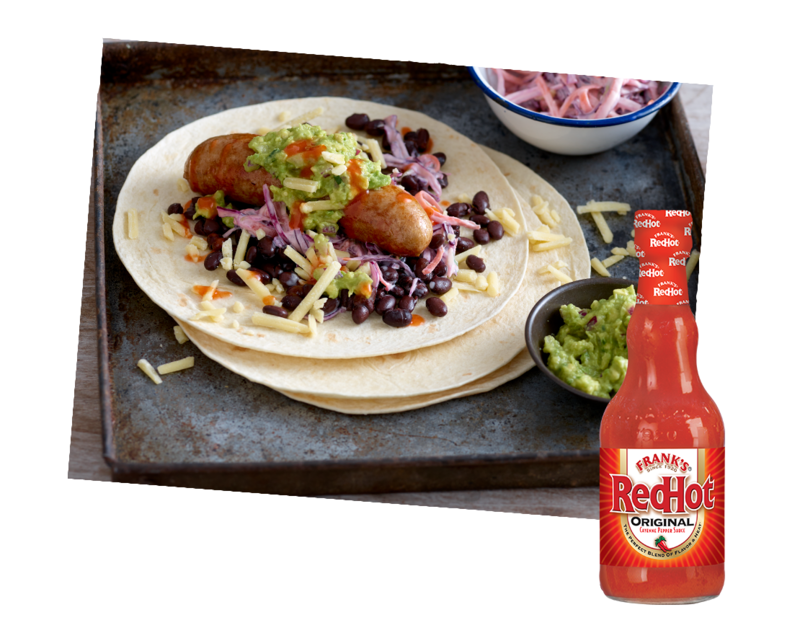 Add the mayonnaise, Frank's RedHot Original Cayenne Pepper Sauce and season to taste with the salt and pepper. Keep until needed. To make the guacamole, place the onion and chilli in a food blender and chop to a rough paste. Cut open the avocados, remove the stones and scoop out the flesh into the food blender and roughly mix, adding the lime juice and coriander to taste. Keep until needed. To assemble the burrito, place 2 tablespoons of the cabbage onto the wrap, add a sausage, and then the guacamole, black beans, and cheese, then serve.